In advance of his Sunday team honors, a look at the triumphs, the follies… and the strikeouts. Sep. 30, 2016, 10:15 a.m.
Ryan Howard will be honored by the Phillies this weekend, with a special presentation set for Sunday. Through years of ups and downs, Howard has just three more games left with the franchise. With no Eagles game this weekend, the stadium should be packed to honor Howard, celebrating all he did for the franchise, and the city. He deserves at least that. That said, let’s be honest. The stadium won’t be full. There will be, at most, a smattering of fans. This isn’t 2008 anymore. The outlook hasn’t been brilliant for the Phillies in some time. The team hasn’t had a winning season since 2011, and hasn’t won more than 73 games since the year after that. From the end of that 2011 season, one that closed with 102 wins and an almost certain trip back to the World Series, the franchise just hasn’t felt the same. 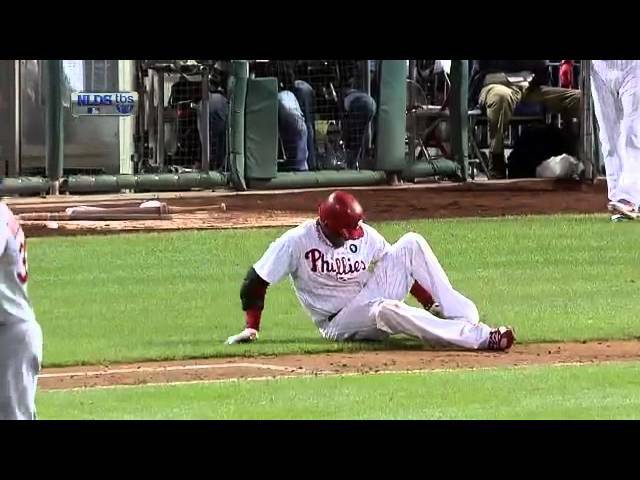 Howard made the final out that year, rupturing his Achilles tendon as he trundled out of the batters box hoping to beat out a ground ball in the NLDS, unable to even make it down the line. 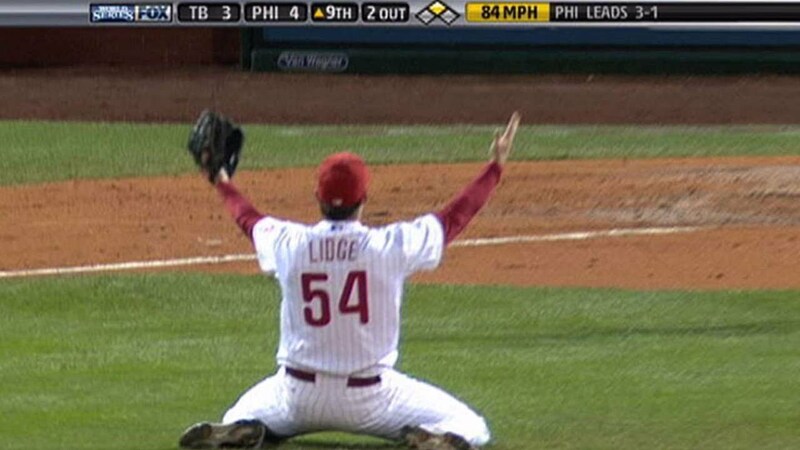 The Phillies suffered a Mudville-ian ending to that season. No, the mighty Howard did not strike out to end the game, but he did fan 172 times in 2011, and another six times in that five-game playoff series loss, an ignominious conclusion to a season that should have ended in another parade. Since that year, and that play, Howard hasn’t been the same slugger. There was still, at times, the same ease to his manner and certainly the same pride in his bearing, but the smile that lit Howard’s face has routinely disappeared over the last five seasons. That’s not to question Howard’s love of the game, but it has been a struggle for him the last half decade. Fans have made sure to point that out nearly every time he found himself advancing to the bat, a sobering reminder of just how much money the team has spent on his contract. Howard won rookie of the year in 2005. He won the MVP in 2006, mashing 58 homers, driving in 149 runs and hitting .313 with an OPS of 1.084, when he was making $355,000. That wasn’t Casey at the bat, it was the second coming of Barry Bonds. Only, well, Bonds never struck out 181 times. Or 199, which Howard did in 2007, while smacking 47 dingers and driving in 136 runs for the local nine. Howard finished fifth in MVP voting that season, the season Jimmy Rollins took home the award. Howard earned $900,000. Due a big pay raise, surely, Howard earned $10 million in 2008, hitting 48 homers, driving in 146 runs — and striking out 199 times again — finishing second in MVP voting to Albert Pujols, but ending the season at the bottom of a World Championship celebration. In 2009, Howard finished third in the MVP race, leading the league again in runs batted in while hitting 45 homers and upping his batting average from the previous season by 28 points to .279. Howard won the NLCS MVP that year, carrying the Phillies through two playoff series to get back to the Fall Classic, before struggling against the Yankees and falling in six games. Howard made — earned — $15 million that season. He was slated to make $19 million in 2010, and in April of that year the Phillies worked out a five-year extension, the largest deal in team history and the third-largest in the history of baseball to that point. Five years, $125 million. Howard was 30 years old, and the extension was panned almost immediately as one of the worst contracts in American sports history. Howard wasn’t even in a contract year when the Phillies gave him the money — after two terrible seasons wrought with acrimonious arbitration negotiations, let’s not forget — but the Phillies eventually rewarded him for his past efforts, overpaying for what they should have expected they were going to get in return. Howard’s extension was set to begin after the 2011 season, one in which he made $20 million and helped the Phillies win the most games in franchise history. But then came the injury, and the recovery, and the slugger hasn’t been the same. How could he be? This was never really Howard’s fault; it was the team’s decision to agree to overpay him. It was the fans for expecting him to suddenly be something he wasn’t physically capable of being just because the franchise had hung this albatross of a deal around the city’s collective necks. That’s not to say Howard wasn’t without blame. Striking out more than 1,800 times in 13 years takes a willful disregard for change that, if handled differently, could have turned Howard into much more of a Bondsian slugger in his old age. Bonds struck out 102 times his rookie season, and never more than 93 in any year of his career after that. The only two seasons Howard struck out less than 100 times were 2012 and 2013 — 99 and 95, respectively — seasons in which he played a combined 151 games. Since returning to the team in 2012 after recovering from that Achilles injury, Howard has hit 95 home runs, good for a homer every 20 at bats. His average before the injury was a home run every 13.2 at bats. Before 2011, Howard had never hit below .250, with five seasons hitting .268 or better and four with at least a .275 average, including the MVP year in ’06 — the only year he broke .300. Since his injury, Howard has cracked .250 just once, hitting .266 in 80 games in 2013. But his OPS was .784 that season, and .718 the year before, when it hadn’t been below .835 in his entire career to that point. As Howard recovered from the injury, his numbers seemed to get worse. He hit .223 in 2014 with an OPS of .690. In 2015 he hit .229/.720, and this year, platooning at first which has limited his at bats to just 319 entering the final series with the Mets, Howard is hitting a career-worst .194 with an OPS of .705. Howard’s batting average for balls in play this year is .202, literally 70 points lower than last season, which was the lowest in his career by double-digits. All while making $25 million each year, over the last three years. Howard said last month in the midst of a hot streak that he wants to still play after this year. He’s convinced he still has what it takes to be a major league slugger. And maybe another situation with a contender will come up. Chase Utley left Philly via trade to the Dodgers and has been a star in Los Angeles. 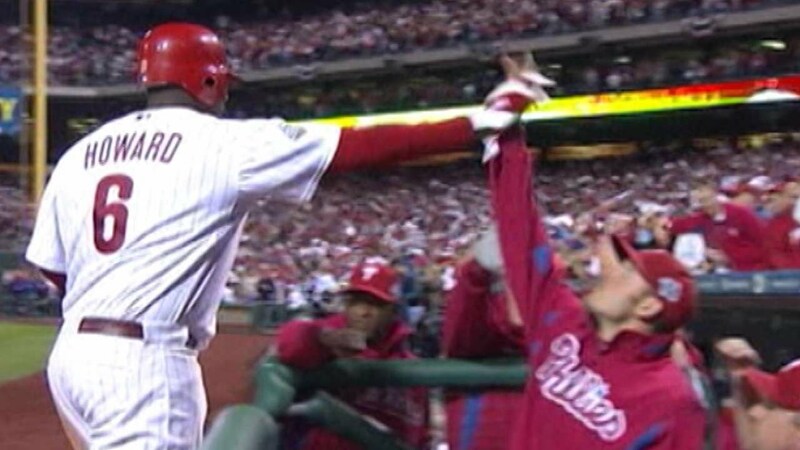 Jimmy Rollins left too, but wasn’t able to rekindle the magic elsewhere that he had in Philly. Howard will be paid $10 million to go away after this weekend, an amazing parting gift built into his contract should the team not want him back in 2017, giving him more than $190 million from the Phillies in his career. It’s amazing to think back on his MVP season, just 10 years ago, to remember how little he earned. But it’s that year, not the last three, we should be remembering this weekend. 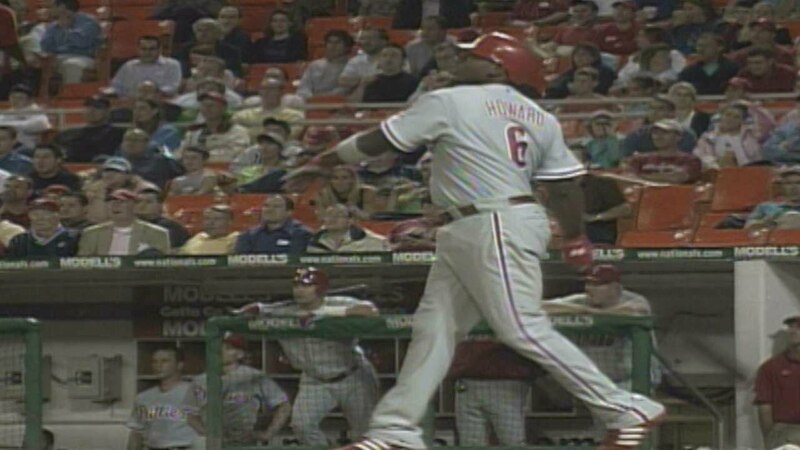 We should remember the Howard that was so hot at the plate in 2004 that he pushed Jim Thome out of the lineup. We should remember the best rookie in baseball in 2005, and the best pure slugger in the game from 2006 through 2009. We should remember the guy who, in that span of four seasons, hit 198 home runs and had 572 RBI, accountable for driving in nearly 17 percent of the team’s runs over that time. Howard is the last player from the 2008 season we have left. Jimmy is gone. Chase is gone. Chooch is gone. This Phillies are giving fans three days to not just remember Howard, but truly send off the team that brought home that championship. We should remember it all. Remember when the sun was shining bright, a band playing somewhere that hearts were light. Remember when men were laughing; hearing children shout. And, sure, mighty Howard — RyHo, the Big Piece, or whatever you want to call him — will almost assuredly… strike out. And that’s okay. We should remember that too; less fondly than the homers, but fondly nonetheless. For without the air shattered by the force of Howard’s blow, we may not have had all the other triumphs, still worth remembering. And worth honoring this weekend.